Note: Store is OPEN on selected holidays. Info will be posted here in advance. TABLE TOP GAMES, & MINIATURE GAMES! ....AND TOO MANY MORE TO LIST HERE! THE ONLY WAY TO GET YOUR MAGIC FIX! BEST PRIZE SUPPORT IN THE AREA! NEW PLAYERS WELCOME! SNACKS AT THE READY! COLD SODA ON TAP! ...THE ONLY PLACE TO PLAY AND TEST YOUR SKILLS! BRING A NEW PLAYER & GET IN FOR $10.00 TOO! New England Comics' store of the south shore. Committed to quality and excellence, NEC New Bedford is the premiere comic shop located in southeastern Massachusetts, designed to meet the needs of any fan of Comics/Gaming or Pop culture in southeastern Massachusetts/Rhode Island area. What will you find at NEC New Bedford? Full line of all the hottest and most popular comics from Avataar, DC, Marvel, Image, IDW, Dark Horse, Dynamite, Boom Studious, Valiant and more publishers from across the comic industry. Looking for DC's Harley Quinn? Batman Eternal? Death of Wolverine? Or the up and coming Spider-Man Spider-Verse? We've got the issues! A solid selection of toys and collectibles including Walking Dead, Batman, Marvel Universe and more! And we always carrying the latest from DC Direct & Marvel Select. JUST IN MARVEL LEGENDS GUARDIANS OF THE GALAXY A/F'S! Selection of Silver, Bronze, and Modern Age collectible comics to satisfy the serious collector looking to fill that hole in his collection. And we are always on the look out to buy Super Hero/Horror Golden, Silver, Bronze, and Modern Age comics. The best selection of collected Trade Paperbacks and Graphic Novels from across the comic industry. We are always stocked with the Batman, Guardians of the Galaxy, Spider-Man, X-Men, Invincible, Naruto, Infinity Gauntlet, Preacher, Deadpool, Star Wars, Walking Dead, Thor, Watchmen, Avengers, Lazarus, Saga, Green Lantern, Civil War, Planet Hulk, Justice League, Fables, Saga, Crossed, Avatar, and thousands more to choose from. Comics for young kids and beginning readers.. Including My Little Pony, Adventure Time, SpongeBob, Sonic, The Simpsons, Marvel Adventures, Angry Birds, Looney Tunes, and many more too numerous to mention here. Plus we carry young reader comics to help you teach your children how to read. Full line of comic collecting supplies. Bags & Boards for the Golden, Silver, and Modern age comics. Long & Half boxes, plus Magazine size boxes. We also have the BEST supply of deck boxes and proctectors for people who need to store their Magic, Yu-Gi-Oh, and Pokemon cards. All reasonably priced. And we also stock 200, 400, 800, and 2400 count cardboard boxes for bulk storage of your card collections. JUST IN...Dragon Shield Deck Proctectors and Dice Master Mats. Gift certificates for Birthdays, X-Mas, or any other time of year. Posters and more posters to decorate that Man Cave or Dorm wall. Batman, JLA, Deadpool, Godzilla, Harely Quinn..that enough? If not come in and see the rest we have! Super Sized parking lot right next to the store. Never have to worry about finding a spot. Solid selection of the latest Magic, Heroclix, Yu-Gi-Oh, Pokemon, & Vanguard CCG's.. We get EVERY NEW RELEASE! Plus we carry Warhammer 40K kits and paints along with regularly scheduled Warhammer 40K tournaments. Plus we now carry the new Star Wars Miniature game, Munchkin games. 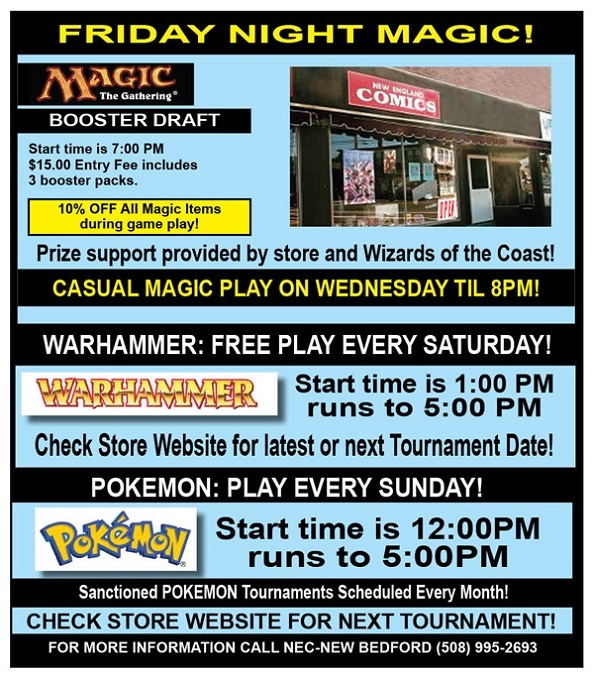 We also have a large gaming room to accomodate instore play, and have regular FRIDAY NIGHT MAGIC TOURNAMENTS and MAGIC PRE-RELEASE PARTIES, plus Pokemon, and Heroclix play. 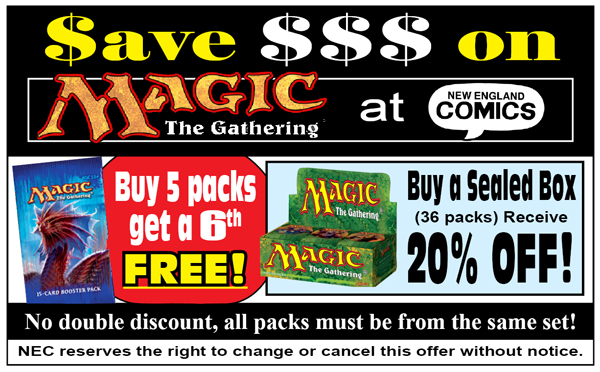 We also carry singles for Magic, Pokemon, Heroclix and Yu-Gi-Oh. The store also now carries a wide range of table top games that includes Ticket To Ride, Justice League Strategy game, Trains, and many more. And if we don't have it we'll order it for you! Do you have a gaming group? Looking to establish a game night for your group? Time and spaces are available. Inquire with the store to set a group up today. Whether you are looking for a full line retailer to satisfy your monthly comic needs, are a casual customer of pop culture, or are looking to getting the gaming phenominon NEC New Bedford is equipped to satisfy your shopping desires. There are none better, but don't take it from us! Come in and see for yourself! We live it. We breathe it. NEC New Bedford, your comic retailer for the 21st century! The best damn comic shop in SouthEastern Massachusetts!